The launch of 2018 initiates the annual “re-set” for patient deductibles. With the ongoing specter of greater patient out-of-pocket healthcare expense (via copays, coinsurance, deductibles, etc. ), the need to engage patients on collections has reached a new urgency. Additionally, patients are now more empowered to “vote with their feet” because they are searching for both lower cost and better access. Front-end (e.g., front-desk) patient collections are a small, but important, cog in the overall revenue cycle (RC) machine. However, it is seldom contemplated in the microcosm. That is, most people review the RC as charge capture, billing, collecting, and follow-up. However, front-end collections are both important and essential. Normally, it’s effective to let the numbers speak for themselves. Let’s look at two examples. In Figure 1, below, we have a fictional private practice with five locations. The practice is open 251 days a year and averages, per clinic, 60 patients per day (depending on the provider coterie, a very safe and fair assumption). The average patient cost (via “purchasing” toward the deductible, payment of past due balances, etc.) for this example is $125 (again, a very safe assumption). 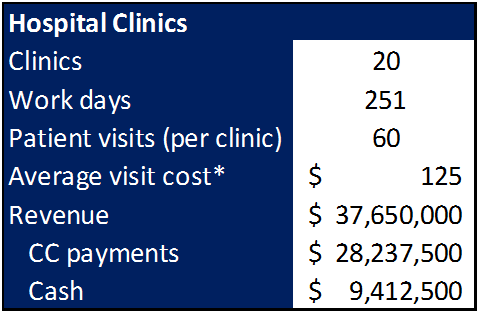 This math also assumes that the patients pay much of their cost out of pocket. Further, 75% of payments are credit card transactions while 25% are cash/personal checks. 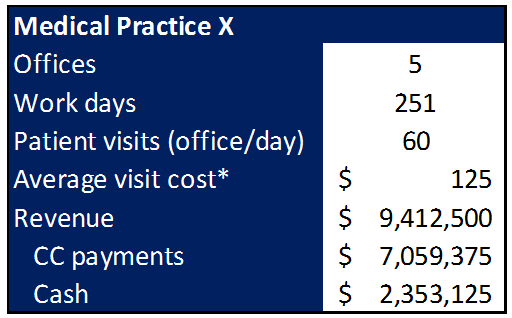 As seen, based on Figure 1’s conservative assumptions, the practice runs $9.4 million in revenue annually. Assuming that that entire $9.4 million is patient responsibility, that means that the practice with weak patient collections protocols is at risk of collecting a mere fraction of the money that is contractually due to the practice based on the patient’s contract with the insurance company. Hypothetically, let’s contemplate that in each example above, that 50% of payments run through and are paid by the payer. That still means that approximately $4.7 million and $18.8 million generated are patient responsibility for Medical Practice X and Hospital Clinics, respectively. This factor translates into several million dollars at risk for inadequate patient collection processes/procedures. Candidly, this is one step among many in the revenue cycle process, and it is quite possibly the low hanging fruit for any system. As with any business, clinics require sound staff and policies and procedures (P&Ps). Invested and respected teammates make the difference when it comes to crafting, deploying, and managing sound P&Ps. Consistency is key. Ensure patient eligibility when scheduling (certainly before the patient arrives for his/her appointment). Provide tools at check-in so patients cannot say “no” to collection efforts. These tools may include kiosks, staff education, and vignettes. Ensure staff is “gently” active in their collection efforts (e.g., sugar vs. vinegar). Consider incenting staff to hit goals. Develop a budget of collections expectations; measure, monitor, manage, and provide feedback. Deploy a well-managed (and protected) credit card on file process. Avoid “…we’ll just bill you later…” engagement at the front desk. This action is never the answer. In fact, the MGMA suggests that the re-work of a claim may cost up to $25 per claim. Build and distribute a payer matrix that captures basic contractual payer terms. Obtain a deposit if a procedure is called. Ensure robust and well-managed discounts (where appropriate) and payment plans (and by “payment plans,” I don’t mean collecting $5/month on a $1,000 balance). There is a balance to be found. Healthcare is not inexpensive. But recall, you are providing a service, and there is value in that service. To offer an absurd analogy, you would not go to the grocery, purchase a loaf of bread, and then either ask the cashier to discount the bread or ask that you pay them later for the purchase. Again, the comparison is a little ludicrous, but you get the picture. Also, the patient’s obligation is part of their contractual commitment with their payer in that this is their “agreed-upon” financial obligation. As this article permeates the chilly climes of January, front-desk staff should already be collecting beginning-of-the-year patient obligations.